Version 7 was a major release for Spotfire, majoring on ease of use and a powerful user interface. The latest version 7.5 adds some significant capability in the area of collaboration, data connectivity , and very significant architectural enhancements. The in-analysis collaboration supports live discussion right down to individual data points via a messaging interface. Visualizations can also be annotated, and annotations can also serve as discussion points. Data connectivity now embraces Redshift, Salesforce and support for SparkSQL. The architecture now supports the automatic programming of resources so that compute power can be configured to meet changing needs (e.g. allocating more compute power to interactive visualization during the day and to ‘batch’ style processing overnight). Users can now build their own ‘Spotfire Cloud’ through elastic use of resources. Spotfire challenges the received wisdom that sophisticated technology is complex, and that easy-to-use technology is unsophisticated. For the large population of business users who simply wish to understand and analyze their data with least possible overhead, Spotfire will oblige. This is particularly true of version 7 where considerable effort has been made to automate routine tasks. However Spotfire goes well beyond routine day-to-day requirements, and as users gain confidence and skills so they can venture into other forms of analytics – statistics, predictive analytics, business rules and optimization, and real-time analytics for processing complex events. Unlike most of the new generation of data visualization and exploration platforms Spotfire will not present a dead-end as requirements become more complex. And it should be remembered that TIBCO has a long-standing pedigree in technologies which support data, process and application integration – something that is absolutely necessary if businesses want to turn the insights derived from analysis into action. Somewhat unusually Spotfire addresses a very broad range of business applications – from business users wishing to create dashboards through to large corporations needing to handle real-time events. 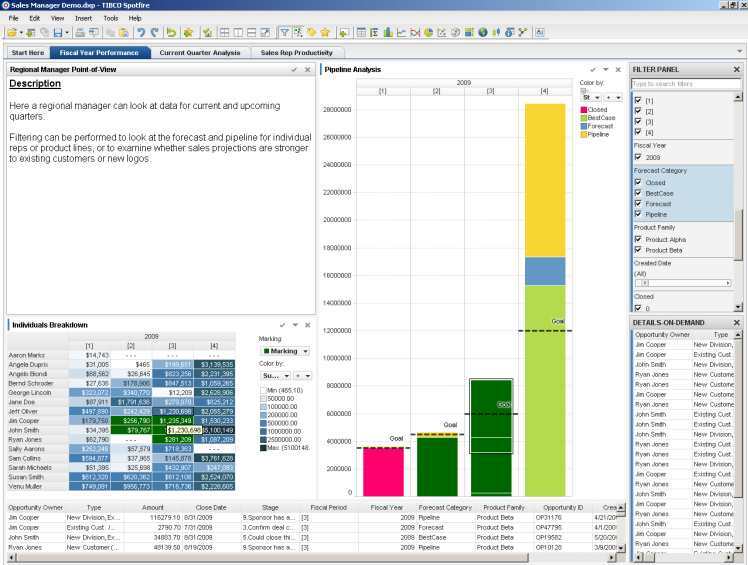 Beyond the use of Spotfire for diagnostic and exploratory data analysis, support is also provided for text analytics, the primary use of which is to detect sentiment, although tasks such as categorization, finding topics within documents, and a whole host of other text analytics tasks can be performed. With its Enterprise Runtime for R Spotfire supports the execution of R scripts for predictive analytics. Other programming languages are also supported including SAS. The real-time analytics capability supports the processing of streaming data, and the detection of pre-defined events. This extends to complex event processing where complex conditions are detected in real-time and actions or alerts generated. Location analytics allow business applications which benefit from location information to be created. Obvious applications include logistics, public services, retail (knowing when prospects and customers are near a store), travel, and hospitality industries. Many businesses will use Spotfire simply for its visual analytics and data exploration capability, but it is reassuring to know that a single platform will support most types of analytics an organization might wish to perform. Spotfire 7 provides a very productive and easy-to-use interface for dashboard, chart and report creation. The new Recommendations feature presents the most suitable representation of data (the actual data and not a static prototype) with just a few mouse clicks, and a redesigned data panel makes data selection and filtering straightforward. Grouping is also a new feature where similar items (a collection of products or regions for example) can be grouped together on a chart simply by dragging the mouse across them. It is hard to imagine how the process could be simpler, and these new features, which are of great benefit to new users, also aid the productivity of expert users. And as with many products of this nature, Spotfire majors on producing very attractive visuals. Spotfire desktop provides a stand-alone environment for users to explore their data and create visualizations and dashboards. An in-memory engine means the analysis is very fast, and for larger data sets an in-database engine can be used via various connectors. Spotfire Platform enables sharing and collaboration in an enterprise setting. It also embraces other forms of analytics including predictive, prescriptive, content (e.g. text) analytics, location analytics and real-time analytics. Only a few suppliers challenge this breadth of capability – and at much higher cost. Spotfire Cloud provides full Spotfire functionality via a cloud based service. A web browser interface is used and generous cloud storage is provided for data. The speed of Spotfire is greatly enhanced by its clever memory and data management. For more modest data sets the in-memory processing ensures very high performance. Larger data sets can be processed in-database, and a hybrid approach called On-Demand optimizes the data held in local memory and that held in the database. This is unique to Spotfire. TIBCO’s roots go way back to 1985 and for many years it majored on it’s middleware products so that applications and data could be integrated. The actual name TIBCO (The Information Bus Company) was adopted in 1997. The company is headquartered in Palo Alto US and has offices around the world. It is now a privately held company with revenues in excess of US$1 billion.